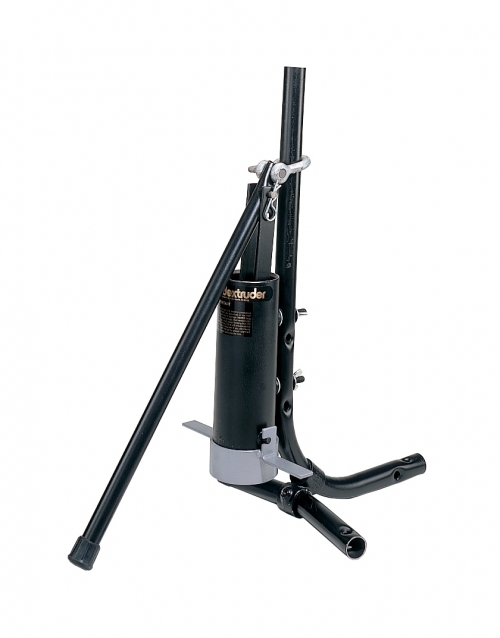 The Kemper IKEG industrial klay extruder gun features a 14" long barrel with a diameter of 2". Comes with 4 dies: 1/8", 1/4", and 1/2" coils, as well as a blank die. This small handheld syringe extruder is great for detail work. 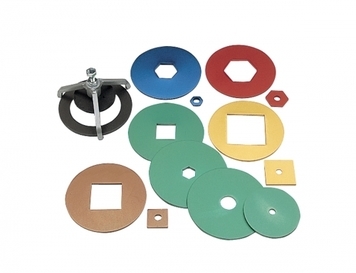 Includes a set of 19 assorted discs that are formed to allow a flush cutoff of the extruded clay. This medium handheld extruder is great for detail work. 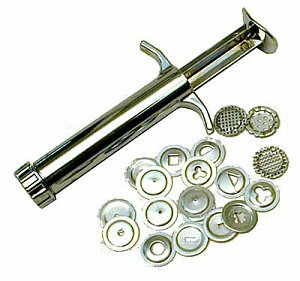 Handheld Extruder includes 5 Dies and 1 Blank made of stainless steel. Comes with these 8 dies shown as well as the barrel to hold the dies in place. This extruder is a heavy-duty steel pipe with wear and stress points case hardened to withstand all production applications. The barrel is 4 inches wide and holds 10 pounds of clay. An easy-to-remove end cap holds the die you choose. 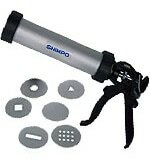 This clay extruder comes with the hardware needed to be bolted to a wall or bench and a 3-piece plastic die set with selector. 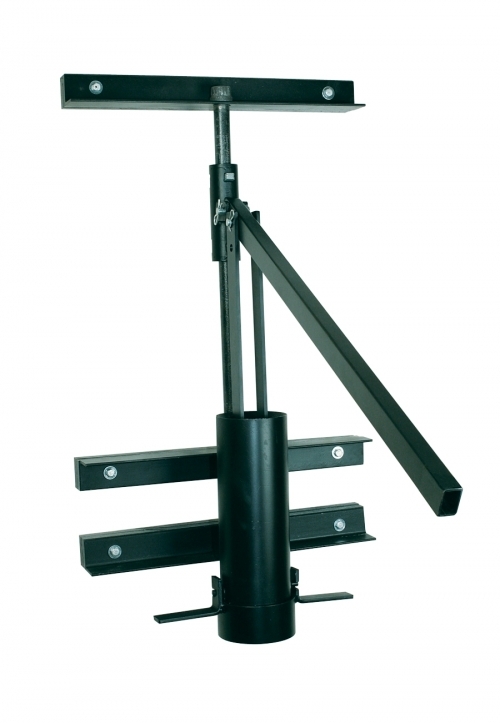 An optional stand can be purchased to attach it to the end of Brent® SR-14, SR-20 and SR-36 slab rollers. 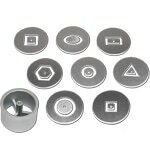 Can also be used with the optional anodized aluminum Standard Die Set or the Hollow Die Set. 1 year manufacturer's warranty. 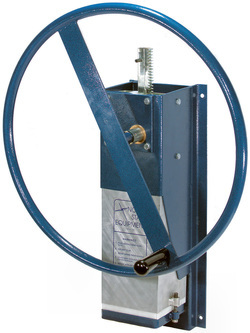 This solid welded steel clay extruder features an EXCLUSIVE brent® safety design. Two sets of clutch plates lock the clutch body assembly firmly in place at any height setting for maximum leverage. Pull up on the top plates to raise the handle and plunger or pull down on the bottom plates to lower them. This design also assures equal pressure with any amount of clay in the barrel. The brent® Clay Extruder HD comes with three mounting brackets and hardware to securely bolt to a wall and the 3-piece die set with selector. The heavy-duty steel 4" diameter barrel holds up to 10 lbs. of clay and an easy-to-use end cap holds the die you choose. The optional standard and hollow die sets can also be used. 1 year manufacturer's warranty. A tube die set to make hollow extrusions. Round tubes: 3/4", 2 3/4" and 3 1/8"; Hexagon tubes: 5/8", 1 1/8" and 1 5/8"; Square tubes: 1", 1 1/2" and 2". Makes 7 shapes and includes selector die. Made from heavy-duty plastic. 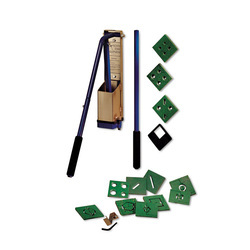 This 2-piece die set including selector is for use with the Brent® Manual Clay Extruder or Brent® Clay Extruder HD. 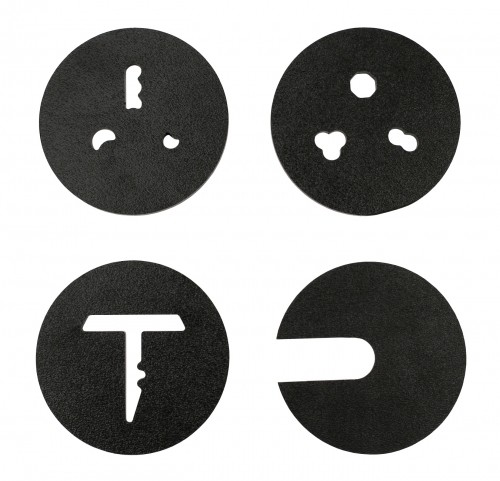 ​Each die is made from anodized aluminum for longer life. Circles range from 3/16" to 5/8" diameter. 4" square stainless steel barrel. The Stainless model offers the most versatility. It can be used with just about any clay type as long as the clay is soft and easy to work with your hands. Because stainless steel won't rust, it is ideal for use with white stoneware clays and porcelain. The Stainless model is offer as a stand-alone unit, without dies, or in value-priced packages. Lifetime warranty! Fits 4" NorthStar extruders. Allows the use of 6" dies on 4" extruders. Accepts custom dies. Mounting hardware and instructions included. Made from high-quality aluminum. The North Star Big Blue Extruder does not look like or work like any others. It is designed to be simple and safe yet powerful. This model features a 6 x 6 x 12 inch aluminum barrel that holds a full 25 pound pug of clay and can produce extrusions up to 4-1/2 x 4-1/2 inches, without an expansion box. Turning the large handle drives a compound rack-and-pinion gear box which dramatically reduces the force needed to make an extrusion. 1-year manufacturer warranty.